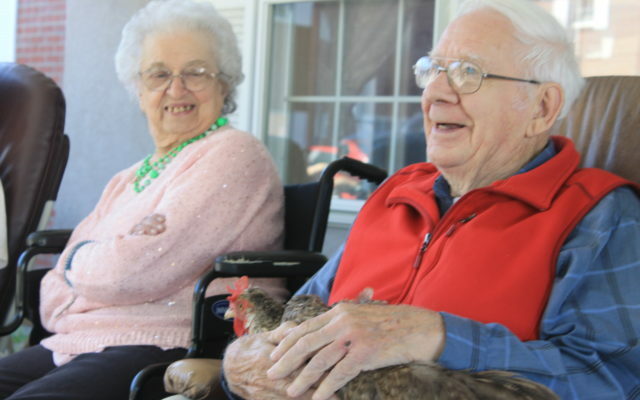 More than 20 residents of the Leisure Village retirement center in Presque Isle shared their Friday afternoon on the last day of August with a group of friendly chickens. 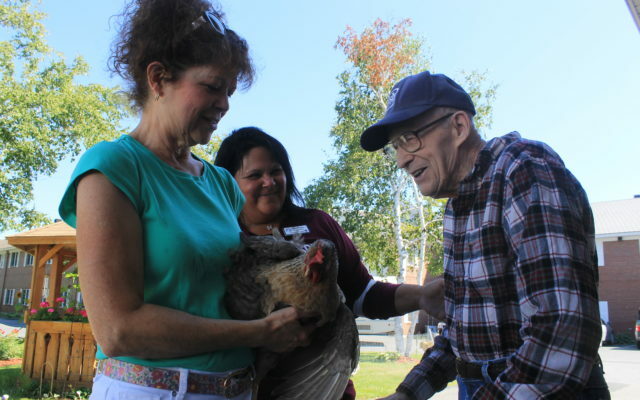 PRESQUE ISLE, Maine — More than 20 residents of the Leisure Village retirement center in Presque Isle shared their Friday afternoon on the last day of August with a group of friendly chickens. Carla Cyr, daughter-in-law of Leisure Village founder Albert Cyr and mother of the center’s manager Doug, brought some of her flock over for residents to enjoy along with the sunny, warm weather. Many of residents at Leisure Village grew up on farms and some raised chickens along with other livestock. “They like to see them,” said Cyr, who keeps a flock of 20 laying hens. Leonard Hutchins, the former owner of the Homestead Lodge in Oxbow, enjoyed holding Cyr’s Light Leghorn, a layer of blue eggs. Cyr let residents hold some of the chickens, while some of the birds ranged on grass nearby in fenced-in enclosures.